Suffice to say, the life of an oak barrel can be a long, fascinating thing. Although a barrel may very well be used just once, such as maturing an American bourbon or California cabernet before it’s recycled, others live on in secondary uses. The American craft beer industry obviously uses plenty of bourbon barrels, and has dipped a toe into every other dimension of barrel-aging as well. And the Scottish whisky industry could hardly exist at all, without the American whiskey industry to provide it with a steady supply of used barrels. But it’s a mistake to think that barrels can be used only twice. Or even thrice! The limits of a single barrel haven’t even been fully explored yet—there’s a possibility they could be in constant use for 100 years or more. Allow me to explain how this is possible. But first, a little info on the wonder that is a whiskey barrel. Given the fact that the world is home to more than 60,000 species of tree, it is rather incredible to think that only oak wood is used in the construction of bourbon and scotch whisky barrels. There are several specific varieties of oak used for barrels—namely, American white oak (Quercus alba), French oak (Quercus robur, Quercus petraea), and to a far lesser extent Mongolian/Japanese oak (Quercus mongolica), but thanks to well-defined laws of what constitutes “bourbon” or “scotch,” no non-oak wood is used. Note, this does not apply to whiskeys hailing from regions such as Ireland, Canada and Japan, where woods such as maple, hickory or chestnut can also be used, although oak is still the vast majority. Why oak? Well, these types of wood are uniquely suited to being made into barrels, in a variety of ways. Oak possesses the desired blend of malleability and toughness, to be bent into barrel staves. Properly stored, it can last many decades. And perhaps most importantly, oak is porous to exactly the right degree for aging spirits—it allows some air to be forced in and out of the wood grain as it “breathes,” which helps draw the liquid inside into the wood, where it extracts flavor and color. At the same time, oak forms enough of a protective barrier to not allow the spirit inside to become unpleasantly oxidized over the course of years. Without oak, we wouldn’t have modern bourbon or scotch as we know it. Wine barrels: Oaken wine barrels come in a variety of sizes, but the primary thing that separates them from whiskey barrels is the degree to which their interiors have been exposed to heat. Rather than the “charred” interiors of a barrel intended for bourbon, oak barrels intended for wine are typically merely “toasted,” which is a lesser degree of heating that doesn’t result in the blackened, peeling appearance of a bourbon barrel interior. Toasting leaves more of the “oaky” flavors of the barrel intact, contributing a less intense profile of vanillans and caramel that are more desirable in whiskey. Bourbon barrels: The U.S. definition of “bourbon” requires spirits labeled as bourbon to be aged in newly charred oak, although distilleries are free to choose from a variety of barrel sizes and char levels delivered by their cooperages—which is the industry term for the manufacturers of barrels. Most bourbon tends to find itself in barrels with the most popular “#3” or “#4” levels of char, but others do exist. The same is true for American rye whiskey as well. The majority of these barrels are the standardized, 53 gallon size—which means they’re significantly more than twice the size of the 15.5 gallon “half-barrel” beer kegs you partied with in college. Yes, the inconsistency in the term “barrels” across industries can be confusing. Scotch barrels/casks: The vast majority of whisky in Scotland is aged not in newly charred oak barrels, but oak barrels previously used to mature American bourbon or other spirits such as sherry, port or wine. Most commonly, this involves the shipping of newly emptied bourbon barrels to Scotland, where they’re filled with newly distilled malt and grain whiskies. After aging in the American ex-bourbon barrels, they may be finished in other barrels (such as port or sherry, seeking specific flavors) before blending. 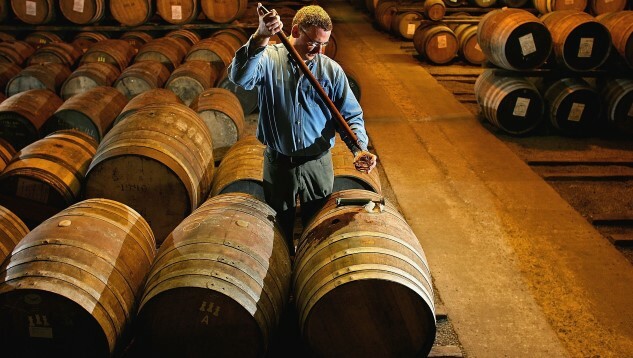 It is commonly believed that used barrels contribute a subtlety that works well with the scotch malt whisky flavor profile, but experiments into using freshly charred oak are increasingly common in Scotland, if often viewed with an air of mistrust. Now then. Let’s talk about how long a single barrel can survive. Barrel Rejuvenation: A Whiskey Fountain of Youth? In the American whiskey industry, a handful of barrels are commonly blended together to achieve a consistent profile in popular, leading bourbon brands, but the scotch whisky industry takes the concept of blending to far more complicated and esoteric levels. Whereas all the liquid in American bourbons are by necessity coming out of newly charred barrels, regardless of age, in scotch things aren’t nearly so simple. Even in a classic Scottish single malt, some of the malt whiskies may be coming out of “first-fill” bourbon barrels—which is to say, barrels that have been filled for the first time since arriving from the U.S.A.—while others are coming from barrels that have been filled two or three times since their arrival. Unsurprisingly, each time these barrels are filled, they contribute a milder impression of oak and char. This is exactly what is desired—a blend of malt whiskies with taste profiles of differing intensity, combined to make a harmonious whole. Finding that balance is the entire point of the blender’s art. But even after a barrel has been filled two or three times, its life doesn’t necessarily have to end. A process commonly referred to as “rejuvenation” also exists, and is employed when it is judged that a barrel has finally been scrubbed of all the flavor it has left to impart. In this process, the very top layer of the interior of the barrel—the part in deepest contact with an aging spirit—is delicately scraped or chiseled away, whereupon the barrel can then be toasted or charred all over again. In doing so, the barrel still retains some degree of the character it had as an ex-bourbon or sherry cask, but is refreshed in terms of the flavor and color it can impart to a newly aging spirit. In effect, this can give a 20, 30 or 40-year-old oak barrel a new lease on life. Curious about the finer details of this process, I contacted Scotland’s Speyside Cooperage, which supplies barrels to many of the major Speyside scotch distilleries. It’s this interplay between “newly toasted” flavors and the barrel’s previous contents that makes rejuvenation such an interesting tool in the cooper/distiller’s arsenal. Moreover, it represents a way to conserve barrels in a time when more food and drink industries than ever want to get their hands on freshly dumped casks of bourbon. Munro has been working his job at the cooperage for more than 30 years, and in the process has unsurprisingly seen just about everything that can be done with an oak barrel. He raises an interesting point: Rejuvenation isn’t a process that can only be done once. In fact, it’s still not known exactly how many times a barrel could theoretically be rejuvenated. But if it’s done every 30 years, by the end of its third go-round, that barrel could very well end up pushing 100. And as cooperages become increasingly cognizant of the need to conserve good oak in a growing whisky market, perhaps we’ll actually see a 100-year-old oak barrel someday. According to Munro, “it all just depends on the physical integrity of any cask, how long it lasts.” If they’re made well, there’s no reason why one couldn’t reach the century mark. Does this mean that someday, the life expectancy of an oak barrel could bypass the life expectancy of an adult male? Well, if we keep drinking plenty of whiskey, it’s entirely possible.